If you’re a fan of The Big Bang Theory, there is a possibility t hat you may have noticed the killer tissue box cover that resides on the table next to Sheldon’s spot. It is a bit of geeky kitsch that definitely stands out! Since my father absolutely loves the show (and Sheldon in particular) I thought it would be neat to make him something that could double as a prop! Or, at least the understudy to a prop on his favorite show. I first looked for one to buy, but they were all yarn on plastic canvas and I just don’t like those types of tissue boxes (they remind me of old people which is probably totally inaccurate). And while my father is older than me I don’t want to push him over the elderly ledge just yet. So I did what any perfectly sane person would do… I stared at screen shots of the box on YouTube and then formulated a plan based on my best assumptions for how this nifty kitsch was created for the show. So here is the box before. From what I can tell this is most likely what the prop is. 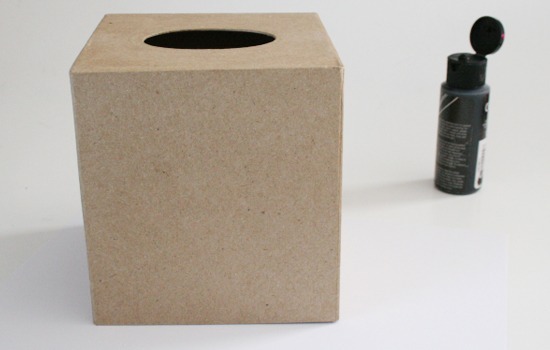 There are also wood covers you can make and DIY, but the texture isn’t right for it to be that. In the end, the paper mache works out brilliantly. 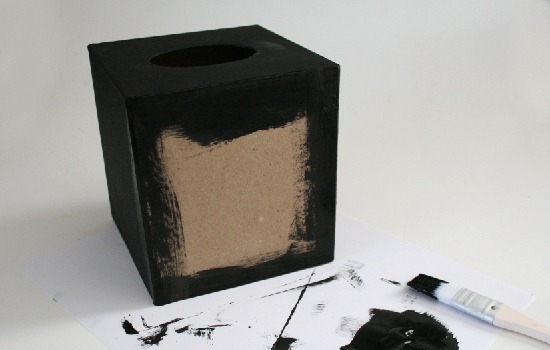 Take your box and paint very, very light coats of black onto it. Be careful because any pooled paint can make the paper texture puff up from the moisture. Just brush it on thinly and repeat with a few coats until you get a nice, black background. In between coats, take out your origami paper and pick out a sheet or two of yellow, orange, green red and blue. My white origami paper was really thin and the black would be visible underneath, so I used regular printer paper for the white. 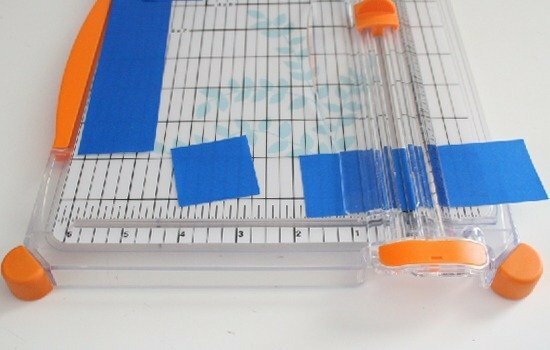 Cut your paper into 1.5 inch strips and then cut those down to 1.5 inch squares. A Rubik’s cube has 9 of each color, so go ahead and cut them out. You’ll be left over with some in the end, but you can pick and choose the best squares with the surplus. You have two routes for this next process, the first is to eyeball it. Honestly there aren’t that many places to put the squares so it is totally feasible… but if you’re OCD like me that just isn’t an option. 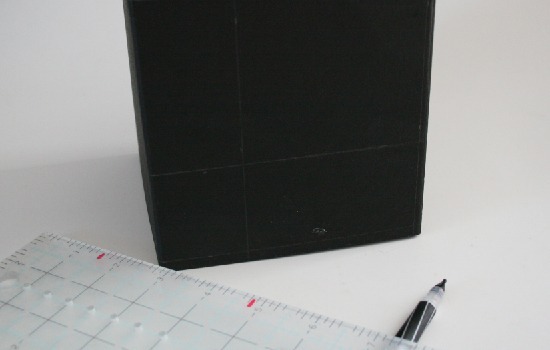 Take a ruler and a pencil and very lightly draw a grid onto the box for placement of your squares. Brush a small amount of Mod Podge onto the backside of your first paper square. 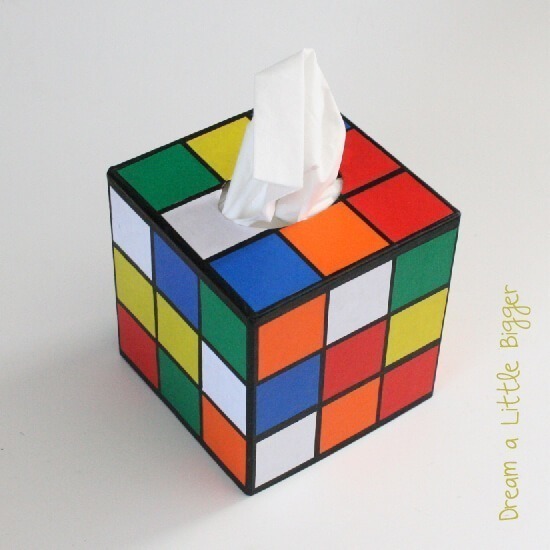 Carefully place onto the tissue box and adjust as necessary. Continue for all 9 squares on one side, placing them randomly. 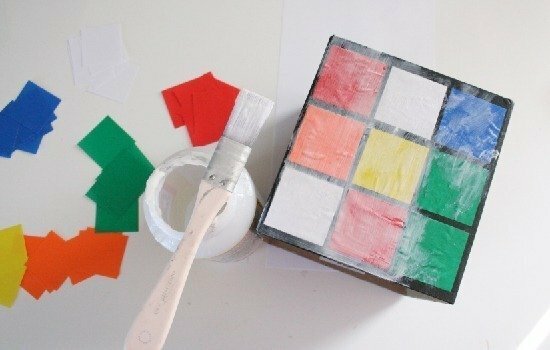 Since you have 6 colors and 9 squares, you’ll have to double a color twice. Go over the entire side with a light coat of Mod Podge and use your fingers to smooth out any wrinkles or bubbles that pop up in your squares. Continue this process for all of the sides, including the top. Trim any squares that overlap the hole in the top that the tissue will come out of or fold the squares inward and glue down. Give the entire box one more coat of Mod Podge and allow to fully dry. So what do you think? Would Dr. Cooper be proud? Hoping your Tuesday is amazing! Super cute. :) Nicely done! You have major skills for seeing something AWESOME and re-creating it for probably half the cost. This turned out JUST the one on the show…. I know your Dad will love it! sorry about the comment, Morena – it happens to me sometimes too and I have no clue on how to fix it!! I just stumbled across this post from http://www.craftgawker.com and have one question – where do you get the papier mache tissue cover? I looked at Hobby Lobby and Michael's, but they didn't have any! Hi, Stacey – I got mine at Amazon here: http://amzn.to/X1cZhf for under $7 with shipping. If I remember correctly, I received it pretty quickly, too. 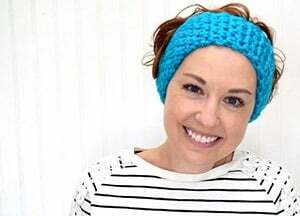 If you think of it, send a me a pic of the finished project – I'd love to see it! Will definitely send a pic of the finished project…once I get around to it – I tend to throw too many craft projects up in the air at a time, haha! Hello! Im from Argentina. I totally love the show and I was thinking to give this amazing cube to my boyfriend as a present! Sorry if my english is not perfect, but I would love to get an answer from you soon! Thanks a lot, again! I just didn't realize it was bottomless hehe! Thanks a lot, you 're a genius :) Hope I can make it. I love the big bang theory! 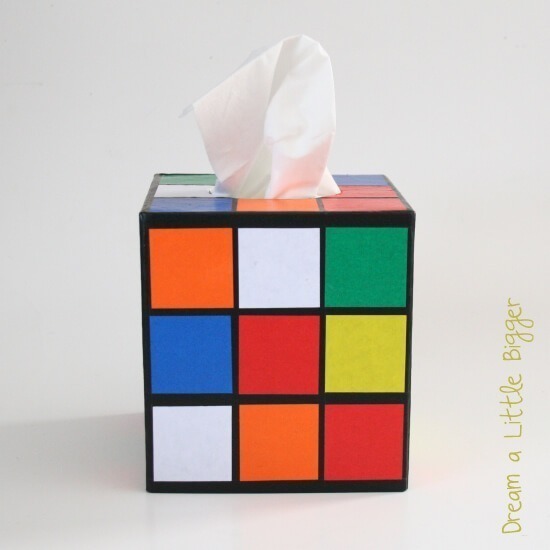 And that box of tissues is so cool! Only one sidenote – that cube is wrong… You have two blue-white edges, but in rubik's cube there is only one. But it is just me. I was so excited to see this project. 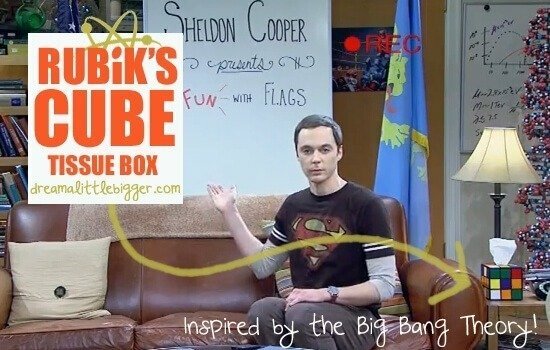 I've been wanting Sheldon's Kleenex box for ever. I'm working on creating mine this very minute. Yay, Marla! I am so excited and hope yours turns out fantastically well! I made my kids make one for father's day. It's not as brilliant as yours of course, being made by little hands, but Dad is sure going to love it! Just wondering what type of mod podge that it that you used. Thanks. I used matte Mod Podge but you could use glossy, too. Good luck! I am so glad you made this and gave a tutorial! 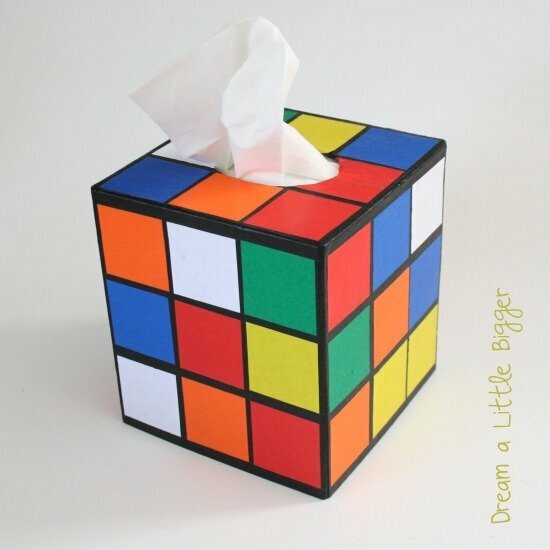 I too have seen the awesome tissue box of Sheldon’s and, like you, had the dislike of using plastic canvas and yarn. You did a great job and it turned out cute and fun! Thanks again! You’re so welcome. Glad to meet someone else who doesn’t like the plastic and yarn. It seems unsanitary to have around snotty people. Ick! Hi, thank you so much for your help – I made this for my Big Bang Theory fan nephew!